Of all the console systems in all the world, Calvino Noir had to download itself into mine. 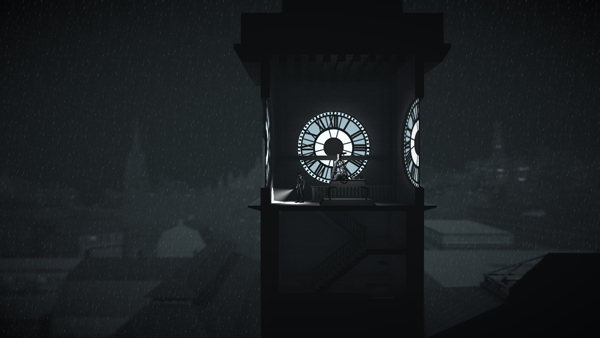 Calvino Noir Limited pays homage to classic Bogart noir films with a stealth game set in a perpetually wet 1930s Germany. A side scroller in the vein of Shadow Complex and Deadlight, the player takes command of Walt, a cynical and world weary “scrambler” (read: spy) who is set upon the all-too-familiar quest of seeking out world-endangering blueprints, only to be betrayed at the last minute. Atmospherically speaking, Calvino Noir nails the look and feel of the genre it so obviously pays tribute. The world is presented in a symphony of grays and blacks and the myriad of characters, themselves caricatures of the genre, help or hinder Walt and his crew for their own personal gains. As good as it all looks, it’s a shame that the game itself didn’t get the same level of attention and care. The bottom line is that Calvino Noir isn’t particularly well built. It suffers from numerous technical issues that ruin any goodwill the rest of the package manages to cultivate. I quit the game early, in the middle of the first act’s second chapter, because of the game’s inherent difficulty as a result of unexpected technical errors, unresponsive controls, little to no guidance, and a control system itself that seems ill-suited for a game of this type. The player controls Walt as he slinks across Germany in search of numerous clues and developments relating to the theft of the plans he was charged to recover. Walt is often partnered with other characters, their ultimate value measured by the abilities they posses. Progression through each chapter is done by completing puzzles and securing mission critical items via each character’s talents. Walt himself is a thug and is useful in taking out guards that patrol environments. Arno, Walt’s friend and confidant, can activate machinery and examine technical devices and other mechanical objects. When it comes to Arno, it’s annoying that whenever he is led to an object, he won’t initiate the cutscene until all other characters have converged to his position. And the party never moves together unless you hold down a specific button (which the game never tells you). Enemies follow along very defined and limited patrol routes, but respond to loud noises and alarms. Their “alert” meter slowly fills up as they detect audible disturbances and if it fills completely, they’ll investigate the source/your last known position. Unlike Metal Gear Solid, if they head to your last position and find nothing, they’ll wander back to their marks none the wiser. Should they spot you, a single bullet from their gun is enough to drop Walt and his friends, forcing you into a checkpoint restart. This is often more trouble than it’s worth, especially since enemies can appear from nowhere and darkened, undiscovered rooms don’t reveal the presence of a guard until it’s too late. To avoid detection or set up stealth kills, characters can hide behind crates and alcoves until danger has past. On paper, Calvino Noir sounds pretty cool. Many of its woes can be attributed to an unorthodox--if novel--control scheme for this game type. Movement is connected to the analog sticks but actions, which are context sensitive, involve highlighting an option using the R1/L1 shoulder buttons. This turns a stealth game into an adventure game of sorts. It would have been nicer if the developers went the whole way and added an on-screen cursor because having to scroll through icons, especially in an area where options are numerous, is tedious, distracting and the cause for many undue deaths. The game probably handles better on iOS (which is also available) as the action buttons are better suited to tapping rather than scrolling through and selecting the most pertinent one. On the PlayStation 4, it reeks of a poor port adaption. Less than favorable control response is another problem that hurts Calvino Noir. It’s bad enough that Walt and his band of spies move slowly, they also have a tendency to get hung up on action animations (Walt, specifically). Characters seem to have a difficult time moving up and down stairs. When you want Walt to attack a guard, you’ll have to wait for the contextual action to appear, select it, and sit through his sneaking animation praying that the guard doesn’t inexplicably turn around and shoot you, which can and will happen, leading to numerous frustrating restarts. The mere action of him standing up was often enough to have the guard turn and fire. Their line of sight and noise thresholds are often difficult to determine. I spent the better part of an hour stuck in a chapter because of the inconsistent enemy response to my characters. Calvino Noir struggles to overcome problems of its own making. The controls are clunky and make the game more difficult than it needs to be. It fails at communicating its own mechanics, so much so that your first interaction with the enemy very likely ends in a very surprising death. I stopped playing after Act II’s first chapter because of the needless, preventable frustrations and technical mishaps (at one point, all audio completely cut out until I restarted the game). Calvino Noir has style, no doubt, but there is no substance to back it up. Take away the novelty of VR and free aiming, and you’ll find there is nothing to differentiate Arizona Sunshine from any other run-of-the-mill first person shooter. Wait for a sale or, if the urge to play a VR shooter compels you, consider Farpoint instead. You could start a stamp collection, go get a coffee, donate to charity, a few value meals from Jack in the Box, or pick up one of those weird LEGO knockoffs that licensed Halo and Call of Duty. Anything is better than Infinity Runner. There is little to stop Castlestorm from being anything but great, great fun. Zen Pinball’s South Park offering isn’t perfect but it will serve as a lovely addition to its already robust catalog of tables.